In a blink of an eye, Hokkaido Santouka Ramen has braced (more like breezed) through a tumultuous year filled with challenges from various ramen stalwarts mushrooming all over Klang Valley. The recent additions of Menya Musashi and Gantetsu at Eat Paradise @ Isetan, One Utama further entrenched this ramen frenzy all the way from the land of the rising sun. But of course, our good neighbour down south (Singapore) has already been severely affected by the ramen wars (Read my review on Ippudo if you will). 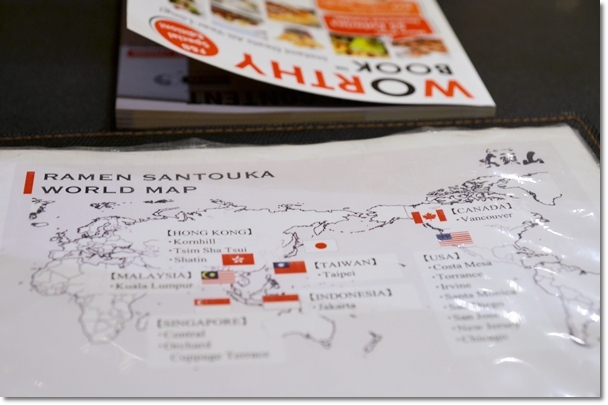 Since Santouka’s grand opening on 29th July 2011, the outlet has remained unfazed by the adjacent Japanese food joints (Suki-Ya’s still booming!) in Tokyo Street @ Pavilion, and clearly Marutama‘s not a strong contender either. 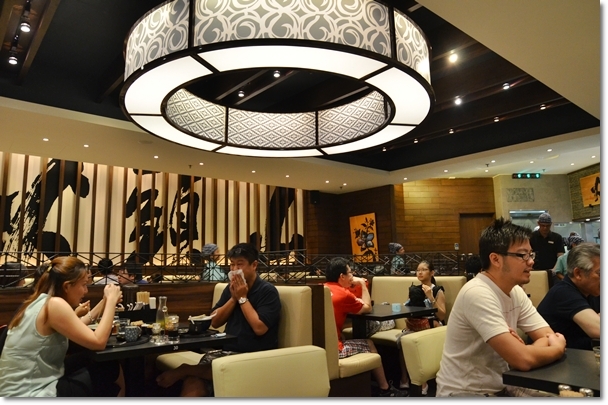 Sans the warm (almost too humid) dining environment, Santouka’s a pretty good option for a quick lunch at Pavilion. The lunch was not planned per se. Yes, I was more than ready to use the Worthy Book vouchers (more on that later), but just so coincidentally, today happened to be Santouka’s anniversary. Although the line was not as manic as the first few months (I remember how the queue snaked to beyond Suki-Ya’s compound), we still had to wait patiently for about 5 minutes before seated. I guess the warm and not-so-cozy dining environment kind of helped in rushing off diners lest one gets too comfortable and refuses to budge while hungry patrons with dagger stares left unseated. I for one, was glad I slurped up my portion within minutes and downed the FOC sides in record time. Beads of sweat were already forming on my forehead midway through. And yeah … we are also ‘blessed’ with the drought in KL lately. How fortunate. 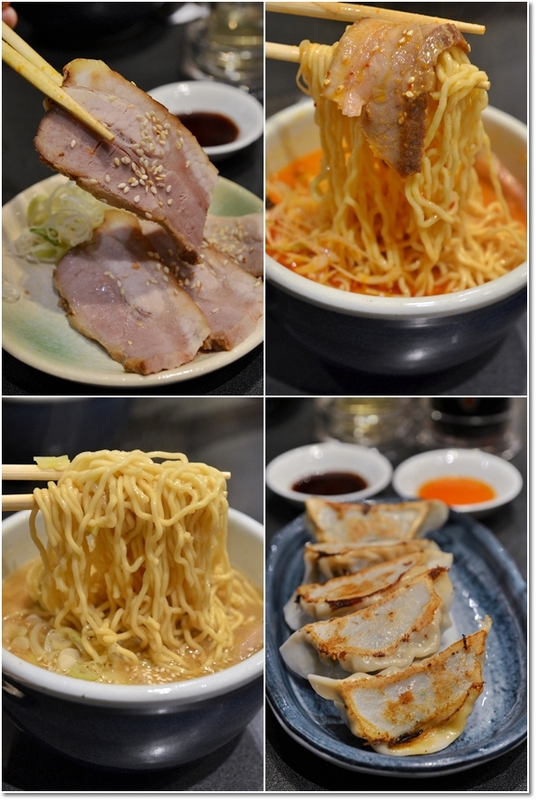 Shoyu Ramen (soy sauce base) and Kara Miso Ramen (spicy miso base) shared the same ingredients; including two slices of roasted pork (cha shu), chopped Japanese leeks, bamboo shoots, seaweed and liberal dash of toasted sesame seeds. The difference lies in the broth. 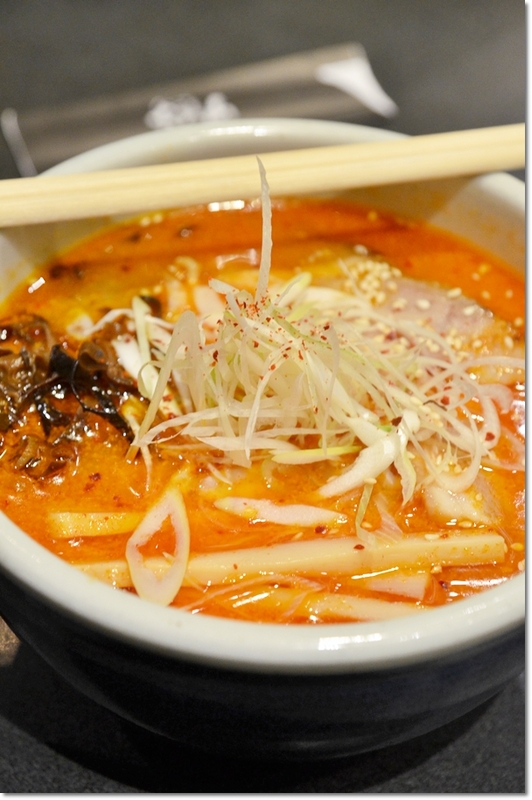 The soup is not scalding hot, and they provide an explanation in their menu whereby they believe that the lukewarm temperature is best for the ramen, and to be enjoyed by everyone. I agree on this point, as I detest having to keep blowing the noodles to cool every mouthful, and worse is when you accidentally scorched your tongue or roof of your mouth from the bubbling hot soup! The noodles at Santouka had this mild alkaline taste the first few mouthfuls, but then dissipated pretty quickly. 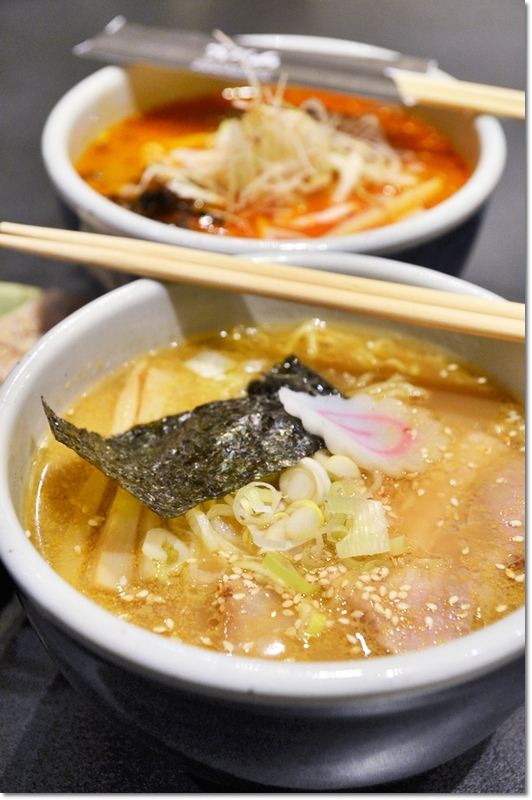 The flavoursome broth is the highlight here, and should be the measuring stick for every good bowl of ramen. I prefer the spicy version (Kara Miso) laden with a bit of kick from the chili oil, though you can of course, spice up your bowl of Shoyu or Shio Ramen with the available condiments (eg: chili oil, chili powder, vinegar). The Cha Shu (roasted pork) was made up of slices of pork about half a centimetre’s thick, studded with sesame seeds and with a ‘healthy’ layer of fat on it. A tad bland when eaten on its own, it will be advisable to dip this lightly into soy sauce or the chili oil, or just dunk them into your bowl of soup. We had four extra slices of Cha Shu thanks to the voucher from the book, as well as a plate of pork gyoza (Japanese pan fried dumplings). Now, what is this Worthy Book I was mentioning? 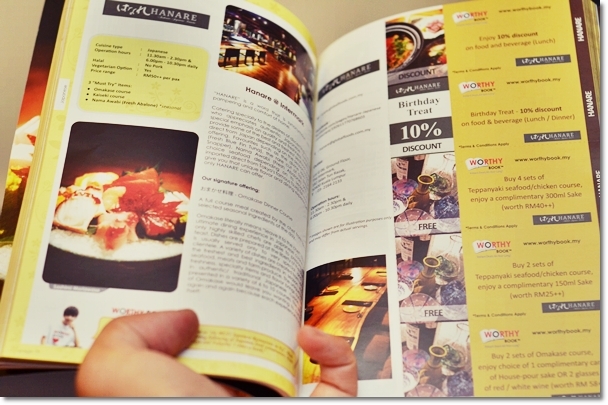 At RM29.90 per copy, and you can get them from major bookstores all over Malaysia, the book combined dining vouchers from various restaurants and cafes all over Klang Valley. This is almost like Groupon gone the traditional route; printed vouchers compiled into a book. 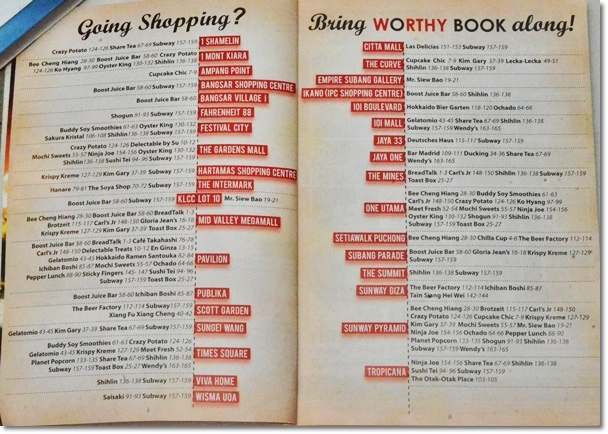 The pulling factor of this book would be the impressive number of food outlets based in shopping malls that participated. Since we Malaysians are shopping-rats come weekends, this will prove to be worthy (ahem, pun intended) during your shopping frenzy this Raya since you’d rather spend the whole day in the mall than purposely driving out for a meal in between. Most of the vouchers expire only in March 2013, thus you have more than ample time to plan your dining adventures within the second half of this year. I have plans for a few in my head now. A Hunan restaurant at Scott Garden and a steamboat restaurant at Sunway Giza come to mind almost instantaneously, while Hanare and Brotzeit should be next on the list. Worthy Book – available for purchase ONLINE and in major bookstores nationwide. *No monetary compensation provided for this write-up, but my copy of Worthy Book was complimentary from the marketing team. Yum! Gyoza my all time fav Japanese food and those noodles look thick and springy. whao, hunan cuisine ??? authentic booo? I so gona test it, hopefully it’s not a rip off like what dragon-i once offer…!! yea… I am so gona visit them this weekend.